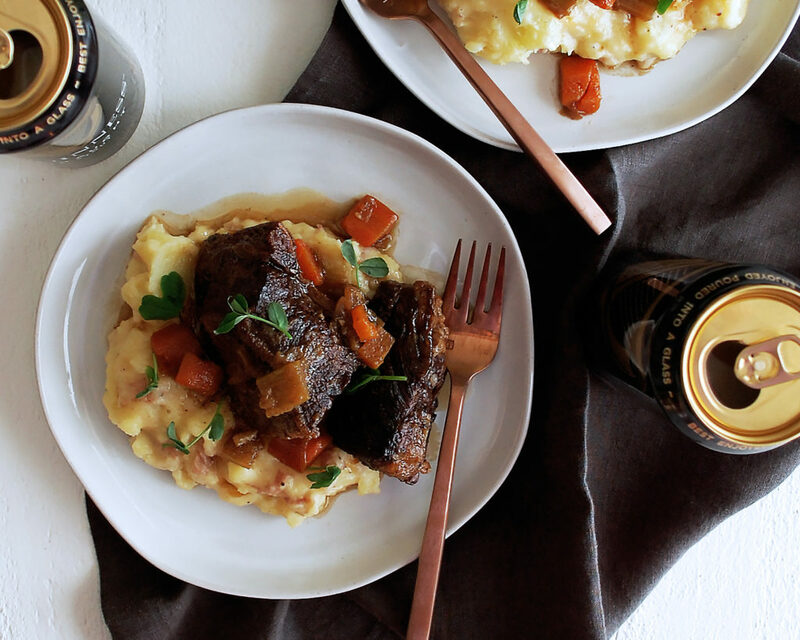 These Stout Braised Short Ribs are going to make your St. Patrick’s Day so delicious. 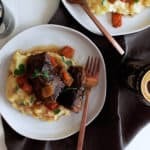 I think short ribs are a hit no matter what, but these stout braised short ribs are especially flavorful, tender, and satisfying. I’m so excited to share them today and hopefully inspire you to get in the kitchen this St. Patrick’s Day. And speaking of St. Patrick’s Day… that means we are officially almost to spring, and I just cannot believe it! It feels like I was just starting to plan for winter content, and now we are already moving into fresh spring fare. Pretty excited about it! While I have loved all the cozy food of winter, like this homemade fettuccine with classic pork ragu, I am very ready for some spring flavors. 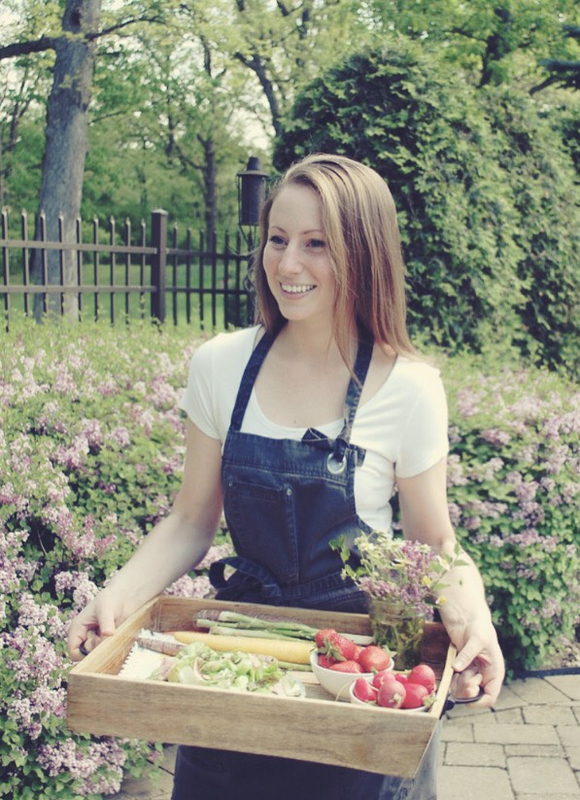 Excited for new ingredients to work with, lots of vegetables and herbs, and all the spring fruit coming our way! It’s going to be a delicious season. But, for now, I’ll leave you with these short ribs…the perfect March comfort food. 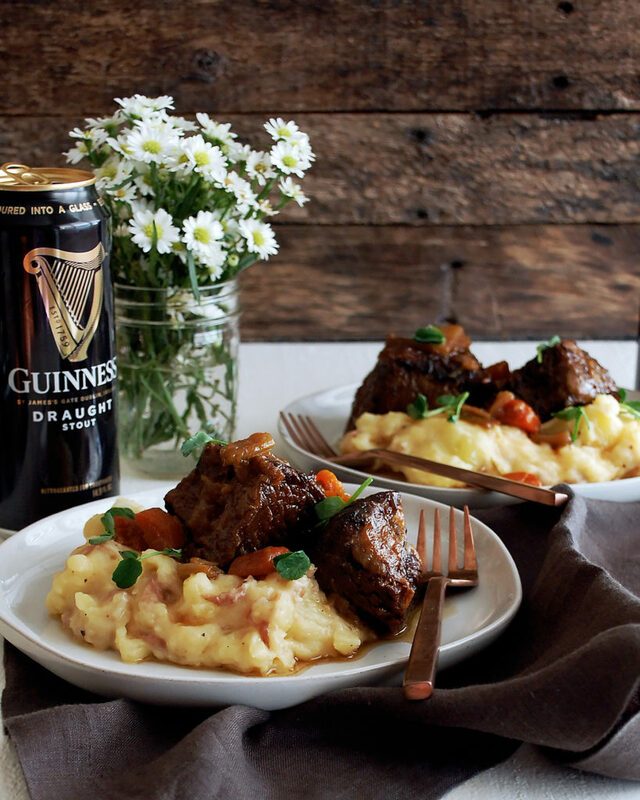 I’ve braised them in Guinness, a dry Irish stout, which made them extra tender and added a rich, complex flavor to the dish. I also added some coriander and caraway seeds, which work perfectly with the beer. The key when you’re doing short ribs is to make sure you get a really nice sear on them first (you’ll want a dark, crispy crust) and then cook them low and slow in the flavorful liquid. Oh, and I’m serving them with creamy, cheesy white cheddar smashed potatoes. And you really can’t go wrong with that! Season the short ribs with salt on all sides. Heat the oil in a large, heavy-bottom pot over medium-high heat. When the oil is hot, work in batches to sear the short ribs on all four sides (you want to hear a sizzle so the meat forms a crust). Transfer the ribs to a plate and repeat until all of them are seared. To the same pot, add the onions, carrots, celery, fennel, and leeks. Cook until soft and slightly brown. Add the garlic, coriander, and caraway seeds. Cook for another 2 minutes. Stir in the tomato paste until well combined. Let cook for a couple of minutes. Stir in the stout beer and bring to a boil. Let simmer for 5 minutes. Add the short ribs back to the pot. Add the beef stock, thyme, and bay leaves. Bring to a simmer. Cover the pot and let the short ribs braise for 2 ½ hours on low heat. Remove the cover and continue to simmer for another 30 minutes. Add the potatoes to a large pot and cover with cold water. Bring the water to a boil and add in a large pinch of salt. Reduce the heat to medium-low and simmer the potatoes until tender. Drain the potatoes. Return the potatoes to the pot and use a potato masher to mash the potatoes, leaving them with a good amount of texture. Over low heat, stir in the milk and honey. Add the cheddar cheese and butter. Let melt. Season the potatoes with salt and freshly cracked black pepper to taste. 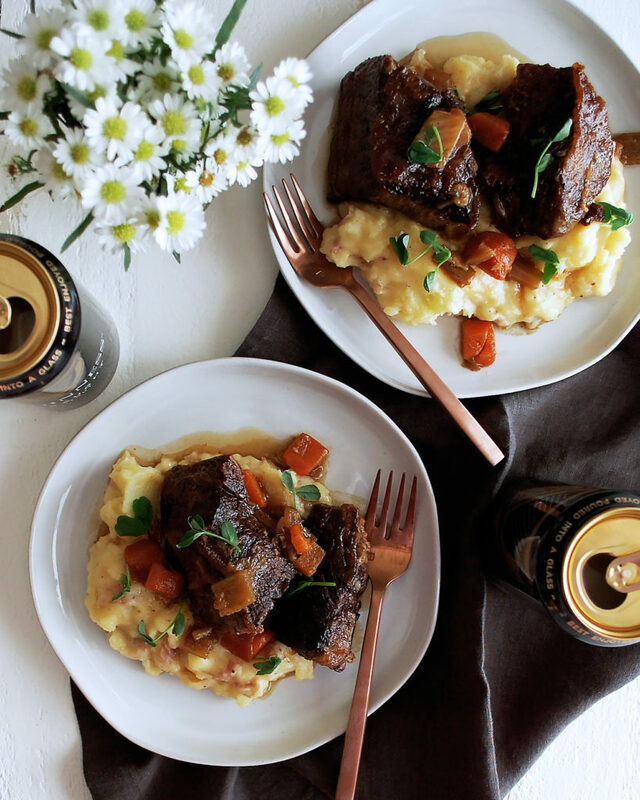 Serve the short ribs over the potato mash with all of the vegetables and sauce from the braise.